Today was just like yesterday. Except it was worse. I woke up in the middle of the night, unable to sleep because of the alcohol in my system. After spending some time putting together the post about Friday, I went back to bed to get a few more hours of sleep. I felt tired and beat the entire day, and once again faced the same decision I had yesterday: should I show up at dinner? The spread on the table was already pretty impressive when I stepped in through the door, and since a few others hadn't arrived yet, it was only gonna get more amazing… and I was right. Together with the food that some of the guests brought along to this potluck, there was probably enough food to feed us three times over, maybe four! There were entire dishes that did not get cooked, and of those ingredients that were cooked, there were a number of them that I didn't manage to touch, as I exercised restraint and kept my intake in check. There were some absolutely delicious gourmet sausages, along with the local variety and hotdogs that one sees in cha chaan tengs (茶餐廳). A whole hangar steak was done expertly by the elves (whose numbers seem to have grown lately). The spicy Korean kalbi from ILL was pretty yummy, and she was (temporarily) forgiven for calling me Arrogant Prick. Our host is well-aware of my fondness of carabineros, and we definitely had enough of these to go around… Absolutely delicious. These little birdies were definitely a request from someone, but of course we all love them. We were stunned by the sheer number of them! Marinated in Mei Kuei Lu Chiew (玫瑰露酒), with that distinctive flavor. A few of the ladies at our table were presented with a "bouquet" of birdies… and I honestly think that they would prefer the birdies to flowers! Of the two different types of corn, the purple variety is much more chewy, and much less sweet. The young new baker in town brought a pile of macarons, meringues and these big, beautiful, yummy canelés. Hard and crunchy on the outside while soft on the inside. I need to call and order up a dozen of these… BADLY. …and we were surprisingly restrained on alcohol consumption. Fun thing about parties like this is that it's a perfect opportunity to open up large format bottles, and there were 3 magnums tonight. Krug Grande Cuvée en magnum - smooth, more subtle and subdued than usual. Lovely on the palate. My contribution. 2005 Pax Syrah Kobler Family Vineyard from magnum - a big wine, no doubt, but surprisingly accessible after about 2 hours of aeration. Still fruity and forward, and jammy. A little metallic minerals. My contribution. 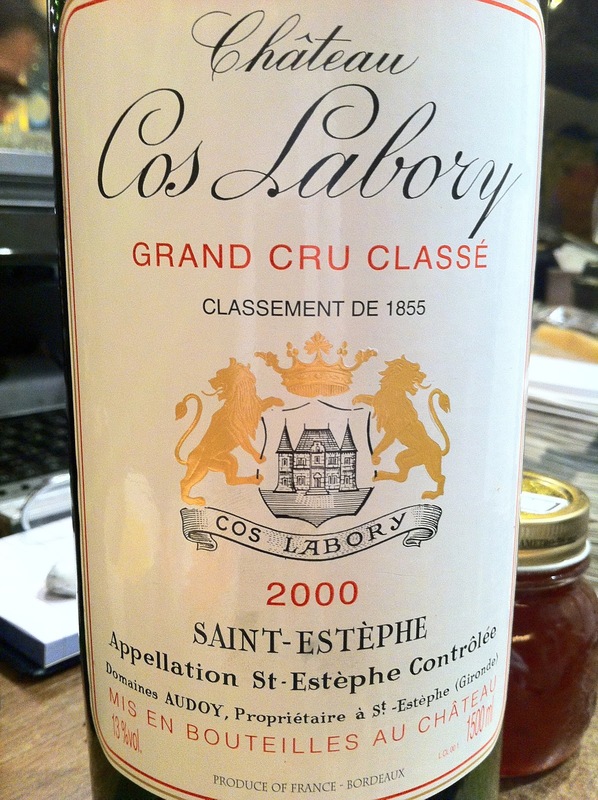 2000 Cos Labory en magnum - very smooth, lovely, smoky, earthy. Classic.